Intent: Creating an advanced Electro-Plasma melee weapon for the graduates of Project: Revenant and Project: Afterlife permitting them to engage lightsabre-wielding foes on equal terms. The Blackwing Electro-Plasma Sword is an advanced plasma melee weapon for exclusive use by graduates of Project: AFTERLIFE, the project responsible for creating the First Order's awe-inspiring Death Troopers. The design of Blackwing Plasma Swords ironically dates back to a Jedi Artifact known colloquially as the "Darksaber" though unlike most lightsabers the Blackwing doesn't receive its' power from some focused kyber crystal but rather an extremely powerful Hydrogen battery which stores the plasma that is contained by magnets around the Phrik blade's edge giving the plasma a coherent shape and burns a deep crimson hinting towards its' scorching temperature of two-thousand five-hundred degrees celsuis and giving rise to the erroneous belief amongst the superstitious that its' wielders are some description of Force sensitive Dark Jedi. The weapon is constructed exclusively from hardy materials which have proven highly resistant to Lightsaber strikes; with the First Order's engineers under no illusion that the Blackwing's wielders may find themselves too close for comfort with the likes of Jedi or other Force Wielders. It's also optimised for use in close-quarters fighting and so the blade's overall length was kept as compact as possible to facilitate its' effective use even within arms-reach of most humanoid species, a feat that many longer blades struggle to achieve. The hilt has pressure technology and the plasma blade will only ignite when the user exerts a pre-determined amount of grip strength upon it; permitting the user to draw the weapon without igniting the plasma blade and is switched off by the depression of two buttons on the pommel for an uninterrupted five seconds. The Blackwing Plasma Sword is a terrifying melee weapon and while it's not exactly a lightsaber and cannot cut through thick bulkhead doors or tank armour it's an extremely effective weapon against infantry. It's hydrogen plasma edge burns at approximately 20,000 degrees celsius and is extremely volatile capable of cleaving through even armour of rare quality and materials, injuries inflicted to the target can often be lethal in the extreme; cauterising the wound and rupturing surrounding bodily tissues and organs through flash vaporisation caused by the extreme temperatures emitted by the crimson blade. Veins and Arteries or other fluid-containing organs can expand and 'explode' within the target with the potential for side effects such as septicaemia and internal bleeding as a result, similar to lightsabers there is usually minimal chance of survival for the victims unless they can receive intense medical care immediately. In contrast to Lightsabers however, it is possible for the blade's magnetic field to get 'snagged' on metal-type armour making it difficult to extract the blade and opening the wielder up for counter-attacks in some cases so the user manual encourages thrusts to the Thoracic region, or slashes that will either decapitate or dismember the target to reduce this risk. When coming into direct contact with another magnetic field of significant strength such as those created by lightsabers the Blackwing's own magnetic field has a habit of ejecting small amounts of plasma creating a visible 'spark' effect, these 'embers' of plasma caused by the magnetic field's disruption have the potential to cause burns to exposed skin and even ignite the surrounding area if there is flammable material presence. Compact: Due to the control the user has over the plasma blade ignition when inactive the weapon is quite compact, small and could be easily concealed when necessary similar to a Lightsaber in this regard. This permits its' storage in the FO-XD's over-the-shoulder Vibroblade sheath from which it could be drawn with surprising speed thanks to its modest size pre-ignition. Its' size also makes it an ideal close-quarters weapon permitting its user to strike even when within arms' distance to a target. Cutting Power: With its' plasma blade ignited at 20,000 degrees celsius the Blackwing Plasma Sword can cut through even the sturdiest Infantry Armours with frightening ease. One quirk due to the powerful magnetic field containing the plasma is that sometimes the blade can get 'stuck' inside an opponent wearing metal-derived armours. Potentially allowing the target to strike back at the wielder. That said, even non-fatal strikes tend to send the targets into shock with the flash-vaporisation of circulatory systems and organs close to the blade. Lightsaber Resistant: Without its' plasma blade ignited thanks to its largely Phrik construction the weapons can survive sustained contact with lightsabers and other Electro-plasma weapons. Offering up a rude surprise to any haughty force sensitives who think to catch the wielder unawares. This makes it extremely useful for engaging in melee combat with force sensitives. 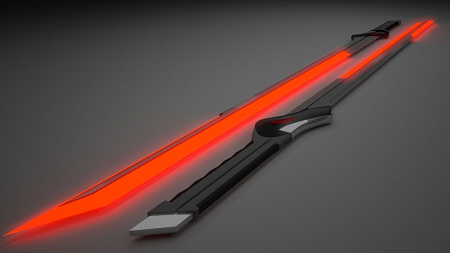 Melt them down: Due to the extreme temperature emitted by Blackwing's plasma blade other melee weapons constructed from common and even tough materials such as Durasteel and Titanium that come into contact with it can be sliced straight through completely; in this sense it's similar to a Lightsaber. The only materials capable of giving its' blade pause are those its' constructed from or materials generally immune to lightsaber strikes such as Mandalorian Iron and Phrik. Distinct Appearance: Due to the weapon's nature when activated it is difficult to miss and easy to identify for observers as a threat especially in low-light situations where the plasma blade burns with a fantastic crimson passion through the darkness. The weapon in an ignited state is additionally incredibly obvious on thermal imagine equipment. Edge Ignition: If pressed against a target and then ignited; the magnetic field cannot properly form and so the superheated plasma flails around wildly and retrogrades down into the battery and can cause a devastating explosion severely injuring parties in close-proximity to the weapon. Particle-Beam Weapons: Particle-Beam type weapons by nature of their operations alongside masers and charrics have the potential to damage the weapon or wielder given the plasma blade wouldn't deflect them as it does with blasters on the off-chance it is hit, another less likely possibility due to its advanced grips is that it might be knocked out of the wielder's hands. Prominent Thermal Signature: The weapons when ignited emit a massive thermal signature and can be easily distinguished with IR/NIR imaging equipment when in this state, alerting potential hostiles to the presence of a formidable enemy. Power Source Scanners: Hydrogen plasma batteries used within the Blackwing weapons can be detected using high-quality Power Scanners, where they appear as no insignificant power contacts. Having the potential to raise suspicion or investigation by so-equipped troops with the potential to endanger the operations Death Troopers will be expected to perform. Metallic Edges: The Metallic edges of the weapon have greatly reduced cutting power despite their Phrik construction and have difficulty at cutting through anything stronger than Plastoid-based armour, even Durasteel proves can prove stubborn for these edges but sufficient brute force from the Blackwing's intended users will eventually cut through. Reducing the weapon's efficiency massively when the Plasma Blade is inactive. 10/04/2019: Edited the Affiliations, Manufacturer and Designer to include the Interstellar Manufacturing Corporation, changed the affiliation to closed-market but left the actual affiliations themselves practically unchanged, but added Project: Revenant. Increased Production Rating to Limited, increased discrete value given for blade temperature. Edited some flavour text in the weaknesses, strengths and description to take into consideration the new Phrik-blade construction. Added previously restricted materials into the blade's construction making it significantly more resistant to sustained Lightsabre contact. Increased overall and blade length. Edited by Kyli Graf, 11 April 2019 - 02:19 AM. maybe use "Significant" here instead of "quite". Otherwise it looks good! Tag me once that edit's made and I'll pass on for approval. thanks to its Turadium, Duraplast and Triprismatic Polymer construction the weapons can survive prolonged contact with lightsabers and other Electro-plasma weapons. None of these materials can survive a prolonged contact with a lightsaber. Duraplast is capable of taking glancing blows from a lightsaber and brief contact, turadium is used for the construction of blast doors and thus it is a combination of the amount of material present in concert with the material's properties that grant the article's description of being difficult to cut through, and stygian triprismatic polymer is simply a harder duraplast. Melt them down: Due to the extreme temperature emitted by Blackwing's plasma blade other melee weapons constructed from common and even tough materials such as Titanium that come into contact with it tend to melt or be sliced straight through completely; in this sense it's similar to a Lightsaber. The only materials capable of giving its' blade pause are those its' constructed from or materials generally immune to lightsaber strikes such as Mandalorian Iron and Phrik. Considering Titanium isn't even close to the most durable of metals in the Star Wars universe, I do not believe that this would simply cut through everything in the same manner as a lightsaber, given this is only 50 degrees celsius hotter than the melting point for titanium. Edited by Nadja Keto, 14 February 2018 - 05:55 AM. Could the Duraplast and Stygian-Triprismatic Polymer be replaced with Turadium then to achieve a similar effect? Just because it's used for the construction of blast doors doesn't mean that it couldn't be used to forge blades, even if it comes with difficulty right? Alternatively I could just convert the entire design into a Force Pike-type weapon and achieve the desired effect of survival upon contact with Lightsabers if you would view that as more acceptable. Edited by Kyli DT-6767, 14 February 2018 - 06:06 AM. This would be preferable. Turadium would still only last a short time before being cut through. I've made edits, removed the reference to 'prolonged' contact and now it should just read 'contact' with lightsabers, which is more vague. Oh and I increased the temperature of the blade upto 2,500 degrees celsius. Edited by Kyli DT-6767, 14 February 2018 - 10:35 PM. scorching temperature of one-thousand seven-hundred degrees celsuis and giving rise to the erroneous belief amongst the superstitious that its' wielders are some description of Force sensitive Dark Jedi. If you could correct the temperature you've put here to your new temperature, this should be okay to go. Alrighty, I've edited that reference to be consistent with the rest of the submission look good now? Updated and Edited, see Record at the bottom of the profile for a summary of edits since it was last approved. Kyli Graf, On average, lightsabers are 130-150 cm in length. This weapon is at 90 cm. Making it have a very distinct disadvantage to the weapon you are creating this to combat. I recommend either increasing the size to be closer in line with the idea you are so desiring, or to specifically mention a weakness of its length compared to the Force User weapons of tradition. Point Taken, I wanted to keep it more along the lines of a shorter blade for ease of storage for the wielder as unlike a Lightsabre it does in-fact have a metal blade as part of its' construction. I increased the overall blade length to 106.5cm and the blade itself to 81.5cm which is significantly shorter than a Lightsabre but I'm not sure if it's short enough to be an additional weakness, what are your thoughts? Kyli Graf, Lightsabers are weapons based off of the mideval Germanic Long Swords. Large and in charge. However, considering that a Katana's blade length is 60 cm, with the over all length around 85-90cm depending on how large the user makes the grip of the weapon, Its still a sword. Short sword, but still a sword. The size changes you have made bring it a little closer, and I feel its appropriate. Enjoy the swords.